Today's walkers of the Cumbria Way have no fear of the fells unlike writers of several centuries ago who described the land as one of “inhospitable terror, barren, frightening and dreadful”. Even the sea came in for criticism as “desolate and wild, a sea without ships”. Since that time, the fells and surrounding countryside of Cumbria and the Lake District have become one of the most walked , climbed, and best loved tracts of land in Europe. The 70 miles of the Cumbria Way provides a generous slice of this beautiful holiday destination. It stretches between the old market town of Ulverston in the south and the historic regional capital of Carlisle standing close to Hadrians Wall in the north. Not only does the Walk lay along a line of distinctive scenic landmarks, but it is also a journey to encounter the character and traditions of Cumbria and its folk. No matter if you choose to make the walk in daffodil time, the summer months or the red and gold colours of Autumn, there will be a village festival or event somewhere along the way. There's opportunity to linger and rest in many well known beauty spots and nearly always in the background stand the Langdale Pikes of which the late Alfred Wainwright said, “No other profile in Lakeland arrests and excites the attention more”. Beyond, are the Jaws of Borrowdale surrounded by Sergeants Crag, High Raise, and Eagle Crag, another of Wainwright’s favourites, and said by him to be such a beautiful fell, much admired, but seldom climbed. Langdale to Keswick is a physically demanding section of the Cumbria Way but the miles between Keswick and Caldbeck are the most remote. From Keswick, the route passes through Gleneraterra Beck Valley between the fells of Blencathra and Skiddaw. For those walking from south to north (as many do) they have a choice at the head of the valley between following the Eastern Route (high route) or the Western Route (low route). The low route is the least interesting but requires much less effort and is advisable in poor weather conditions. The high route progresses onwards to Caldbeck up and over Lingy Hill and High Peak, the highest point on the whole journey, which can be blanketed in dense mist and create difficulties in following the trail. The remaining section from Caldbeck to Carlisle is mostly flat and for a good deal of the way accompanies the River Caldew via the villages of Buckabank and Dalston before entering the built up areas of Carlisle and the generally agreed finishing / starting point of Carlisle Castle. Check weather forecast for local conditions. Wear colourful clothing and suitable footwear with treaded soles and firm ankle support. Is your mobile phone battery fully charged? Be aware of poor signal coverage in some locations. Leave a plan of your start and finish points and contact details. Take some sandwiches or a flask of soup and a drink. Have a good meal before setting out. Should you wish to contact a Mountain Rescue team in an emergency, call 999 and ask for police. The police will then alert the appropriate team for the area. Hearing and speech impaired people can send an emergency text message to 07786-208999 (Cumbria area) but enquire at the local police station before leaving. Ulverston – Coniston. 15 miles. Coniston – Langdale. 11 miles. Langdale – Keswick. 16 miles. Keswick – Caldbeck. 14 miles. Caldbeck – Carlisle. 14 miles. OL 4, 5, 6, and 7. Events and festivals along the route. 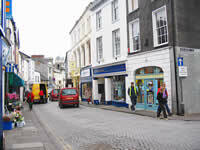 Ulverston is a busy thriving market town with all the social and business amenities expected to be found in a larger community. There's a good range of shops, cafés, restaurants and pubs, plus banks, Post Office, Tourist Information Centre and excellent passenger train and bus services. An impressive sculpture, fashioned to represent a compass and a cairn, has been erected in the town centre to mark the beginning of the Cumbria Way Walk. Pre-walk accommodation within Ulverston and the surrounding areas are well equipped to meet the needs of those preparing to embark on the 70 mile trek north to Carlisle and many will provide a pack of sandwiches and a drink to sustain you on the way to the next stop. More information can be found on our Ulverston Information page, and a list of annual happenings in this “Festival Town” is shown on our Events Page. Coniston is reached over well used tracks and paths via the small hamlets of Broughton Beck, Gawthwaite, Blawith and Torver with a lakeside walk to complete the last few miles of the journey. There's not much scope for refreshments en-route except in Torver where walkers can rest and enjoy a well earned meal and drink in either of two old worlde pubs. Coniston, waymarked by the imposing presences of Coniston Old Man and the beautiful Coniston Water is a favourite gathering place for walkers and climbers from far and wide. 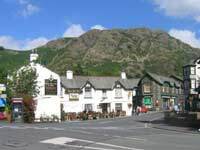 A wide variety of accommodation in Coniston is available within a mile or so of the town centre with a good selection of camping sites, bed and breakfasts, hotels and self catering from which to choose. Hill Top, Near Sawrey - The home of Beatrix Potter. Tarn Howes. - A 2 mile walk to probably the most photographed feature in the Lake District. Hawkshead - Said to be the prettiest village in the Lake District. Beacon Tarn - A much admired small stretch of water from where there are lovely views. Ahead, and in view, stand the high fells of Pike O' Blisco, Pike O' Stickle and Harrison Stickle forming the classic contour of the Langdale Pikes. This 11 mile section of the Cumbria Way Walk fully conveys the magic and the inspirational qualities of the Lake District as the trail proceeds via a series of traditional Cumbrian hamlets and small villages on the approach to the Langdale Valley. “The valley rings with mirth and joy” wrote William Wordsworth in the opening line of “The Idle Shepherd Boy”. Skelwith Bridge occupies a peaceful riverside position alongside the River Brathay and close to the tumbling waters of Skelwith Force with room to sit and relax on the wooded river banks. Food and drink are available in the nearby 3 Star Hotel or in a newly established tearoom with adjoining gift shop. Elterwater Lake - Tranquil setting with great views of the Langdale Pikes. Blea Tarn - A much photographed stretch of water looking toward the Langdale Pikes. Stickle Tarn - Feeds the Dungeon Ghyll Waterfall. Lingmoor Tarn - A small secluded tarn. Wrynose Pass - Steep winding spectacular ancient Roman road. 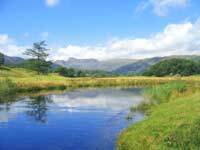 Elterwater is a firm favourite as a visitor destination and gathering place for walking and trekking enthusiasts. It's a typically picturesque Langdale Valley village of neat stone cottages, a well stocked shop and a welcoming pub. Chapel Stile has often been described as one of the most beautiful settings to be found in the Lake District. Tearooms, a shop and a cosy pub provide well for the visitor. Dungeon Ghyll is a small community resting in the much loved area of the Langdale Valley's high and low level walks, treks and hikes, and close to the Lake District's most impressive waterfall cascading down from Stickle Tarn. Camp sites, bunk barns, bed and breakfasts, guest houses, self catering and hotels are available in this sector of the Cumbria Way. However, this part of the region is one of the Lake District’s most visited holiday destinations, especially in the summer and autumn months. Those walking the Cumbria Way and wishing to stay close to the route are advised to make an early accommodation booking and check if single overnight accommodation stays are available. Service 516 operates between Ambleside and Dungeon Ghyll via Elterwater and Chapel Stile. 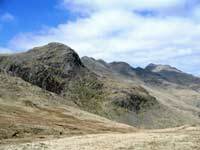 It's not too far after leaving Langdale and crossing the Stake Pass, that the walker enters the Borrowdale Valley. The Parish of Borrowdale includes the villages of Seatoller, Stonethwaite, Rosthwaite, Grange, and the hamlets of Watendlath and Seathwaite. A newspaper article of 1880 reported a rainstorm during which, “the road approaching Rosthwaite was inundated at the lower parts fully to the depth of a yard and a quarter, and foot passengers had to take advantage of the accommodation afforded by the wall which is covered by flat stones for that purpose”. Borrowdale holds the record for the heaviest rainfall in England, but visitors can rest assured (and in comfort) they no longer need to rely on the accommodation offered by a stone wall. 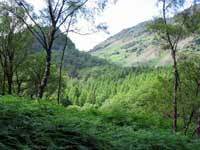 The Borrowdale Valley provides a large choice of holiday accommodation comprising of camp-sites, camping and bunk barns, bed and breakfasts and hotels clustered in and around the villages and hamlets. Rosthwaite, the largest of the communities, and Stonethwaite, are well used stopping points on the Cumbria Way to pause for refreshments and take a breather. A small detour away from the recognised route is required to include the village of Grange, but it is well worth the effort. There's a shop, pub, tearoom and café in a lovely riverside location and the opportunity to picnic by the waters and dip and cool weary feet. Keswick, standing next to the beauty of Derwentwater, is a town largely given over to the tourist industry and quite rightly so. It has a plentiful number of retail shops, food stores, Banks, Post Office, Tourist Information Centre and regular bus services connecting to all parts of the country. The nearest Railway Station is Penrith on the West Coast main line between London and Scotland. Castlerigg Stone Circle - Prehistoric monument of 38 stones believed to have been used for religious purposes. The Bowder Stone - A massive 2000 ton boulder which was possibly swept down from Scotland during the Ice Age. Watendlath - Hamlet and small tarn reached via the much photographed Ashness Bridge. Level walks around the shores of Derwentwater. The Borrowdale Rambler. Service 78. Keswick to Seatoller via Derwentwater Lakeshore, Lodore, Grange in Borrowdale and Rosthwaite. The Honister Rambler. Service 77 / 77A. Takes in Portinscale, Catbells, Grange in Borrowdale, Seatoller, Honister Slate Mine, Buttermere, Lorton and Whinlatter Forest. The Caldbeck Rambler. Service 73 / 73A. A circular route from Keswick to Caldbeck. The 73 goes via Applethwaite, Mirehouse, Dodd Wood, Bassenthwaite Village, Uldale and Ireby to Caldbeck. The 73A returns to Keswick via Hesket Newmarket, Mungrisdale, Threlkeld and Castlerigg Stone Circle. The Osprey Bus. Service 74 / 74A. Keswick to Mirehouse / Dodd Wood. 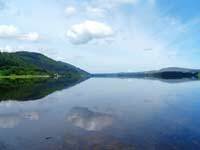 This is a journey to explore Bassenthwaite Lake with a stop at Whinlatter Centre where the Ospreys can be seen, Thorthwaite Galleries, Dubwath Wetland Nature Reserve, Trotters World of Animals, Mirehouse and Dodd Wood. Opening times. 9.30am – 12.30pm. Wednesday, Thursday, Friday & Saturday. Cash Withdrawal Facility. Tel: 017687 77304. From Keswick the walker has the choice of following either the high or low level route to Caldbeck. The low level passes through the hamlets of Orthwaite and Longlands standing at the foot of Skiddaw whose not too strenuous ascent rewards the climber with yet another wonderful Lakeland panorama. Orthwaite and Longlands consist of only a few scattered buildings but a slight deviation from the recognised route takes you to the village of Bassenthwaite. Here, you can take a meal or snack in the congenial atmosphere of a centuries old coaching inn. There's a good range of holiday homes, bed and breakfast accommodations and some which offer barn style over-nighters. You may wish to break the journey and visit the 17th C Manor House and beautifully landscaped grounds of Mirehouse with paths leading to the 13th C Church of Saint Bega on the shore of Bassenthwaite Lake. A beautiful well kept Cumbrian village often visited but never over-crowded and where the visitor can unwind in the remoteness and rugged beauty of the district. Several well known walking and cycling routes meet here including the Reivers Cycle Route and the Coast 2 Coast. 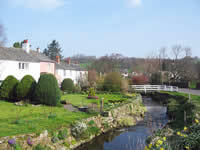 There is a good range of Caldbeck holiday accommodation and the surrounding communities of Hesket Newmarket, Uldale, Millhouse, Boltongate, Ireby, Wigton, Sebergham, Hutton Roof and Brackenthwaite. For more information visit our Caldbeck information page. The Post Office is situated in the village store. Open Monday – Friday 9am – 5.30pm. (closed for lunch 12.30-1.30) Saturday. 9am – 12.15pm. Village Store - Open Monday – Saturday 8am-6pm and Sunday 9am - midday for the sale of groceries, wines, spirits, beers, sandwiches, newspapers and much more. Train Services - Nearest station is the unmanned Dalston on the Cumbria Coast Line. The route is almost completed and the walker leaves the Northern Fells and enters the gentle rural landscapes on the edge of the Solway Plain. The first community of any size is the village of Welton which is included in the Parish of Sebergham together with the hamlets of Nether Welton, Churchtown and Warnell. Dalston follows next. It is a large village 4 miles from Carlisle with shops, Post Office, a request stop railway station and frequent bus services to and from Carlisle. 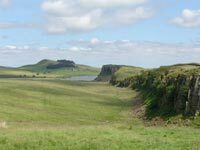 This sector is an area well known for its walkers, cyclists, hikers and horse riding trails, many of which lead to the World Heritage Site around Hadrians Wall. There are all categories of hotels, bed and breakfasts, self catering, caravan and camping sites and hostel accommodation on offer with schemes of “walkers welcome”, “cyclists welcome”, “families”, “pets”. 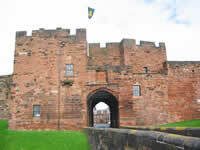 Carlisle of course is a city providing all business and social amenities and many places of historical interest. On arrival you may wish to call at the Tourist Information Centre and register your completion of the Cumbria Way in the Route Log book. Dalston Hall Caravan Park is situated central for the Lake District, Solway Coast, Border Counties, Hadrians Wall and yet only 10 minutes from Carlisle. A family run caravan park is set in the beautiful grounds of Dalston Hall Estate. The park is AA listed, BH & HPA registered. The old stables have been converted into a club house which serves breakfast and a variety of bar meals. We feel confident that you will find a relaxing, and away from it all holiday in the peace of the Cumbrian countryside. Daffodil is a one bedroomed luxury 5 star bed and breakfast B&B appartment; and lies outside the small, picturesque village of Hesket Newmarket in the Mungrisdale valley of the Northern Fells. It offers a luxurious bedroom, with super king size bed and DVD/TV with iPOD docking, bathroom with large walk-in shower and breakfast room. The private breakfast room allows guests complete privacy. We offer a flexible breakfast and supper service to suit our guests requirements. The apartment is part of Banks Farm, a former 17th century Lake District hill farm. A small holding of five acres we have free range hens, geese, oxford sandy and black pigs, hebridean sheep from which a lot of our food is supplied including bacon and sausage for breakfast. We also grow a selection of food and vegetables and are experimenting all the time! The views from here are fantastic, with hill walking and cycling to be enjoyed from the door of the Lake District National Park. Denton House is a very friendly 4 star rated bed and breakfast guest house sat in the centre of Hesket Newmarket, overlooking the village green. Dating back to the 17th century, this spendid house has 8 guest rooms which can be let as double, single, twin or family rooms on a bed & breakfast (B&B) basis. Gill Beck, a lovely pink-washed Cumbrian cottage is set in a stunning beck side location near the centre of Caldbeck village and only a very short walk from the local shops, The Oddfellows Arms and tearooms - the Watermill Café and the Old Smithy. Gill Beck is open mid-March to 1st November. Short breaks are available so please ask for details. 2 person reductions except for Peak Season. Friday to Friday lets. Located amongst picturesque views in an unspoilt countryside, The Gardener's Cottage offers a tranquil retreat on the very edge of the Lake District. Situated less than 3 miles from the Caldbeck Fells, the area provides a perfect location for walkers - the lakes of Ullswater, Derwentwater and Bassenthwaite are less than 30 minutes drive away - a perfect gateway to The Lakes. The Gardener's Cottage is Available All Year. Children very welcome. 1 well behaved dog only and NO SMOKING. Inn Way to the English Lake District.